2. Structural terms – used in describing braided structures (“weaves”). Any movement of loops by the fingers. A very specific kind of move—a move in which a loop is interlaced with or through another loop or loops. A square braid has two loop transfers that repeat over and over again. One is on the left and the other on the right. In each of these loop transfers, a loop is pulled through all the one or more loops between its starting point, and its new finger on the other hand. There are more moves than this in each cycle, but only 2 transfers. A move that rearranges the loop or loops on the fingers, without interlacing them through any other loops. Ideally, this move is performed by the finger that the loop is shifting onto, not by a “helping” finger of the other hand. It’s usually done in order to put the loops back into their correct starting-position set-up after a loop transfer occurs. In the 15th C. manuscripts, shifting loops was called “walking the bows,” which is how it feels, a very reflexive and easy motion that looks complex—like a centipede walking. It was also called to “hi” or “low” the bows, depending on which direction the loops were being shifted. A move that connects the two halves of one braid—traditionally done in team braiding. Typical example: After each of the individual braiders has finished the moves of one braiding cycle, the two (or more) partners then exchange their closest loops to connect the individual braids into one larger braid. Noémi Speiser also uses the term “loop exchange” for one particular type of loop transfer: in which a loop on a finger of one hand is exchanged with a loop on a finger of the other hand, one of the two loops passing through the other in this process. The Spiral braids (video links at the bottom of my Tutorials page) are made with this type of loop transfer, as are several other known loop braids. One repetition of all the braiding movements, after which the same exact movements are repeated. 2-pass braids like square braids have two loop transfers in each cycle of braiding, one on the left and one on the right. Spanish braids have 4 loop transfers in each braiding cycle (as do my double braids made by a single braider). The 8-loop spiral braid—or ‘lace bend round,’ also has 4 loop transfers in each braiding cycle, before the same sequence of moves repeat. (Their loop transfers could also be called “loop exchange moves”.) The letterbraids have 8 loop transfers in each cycle – 4 on each hand. In a pattern chart, each braiding cycle is shown on a separate row of the chart, so in my pick-up tutorials I tend to use the word row rather than cycle, but they mean the same thing. This is the term for the length of braid, or of braiding, that it takes before all the colors return to the original color-arrangement on the fingers. This will equal one full expression of the color pattern on the braid, after which that same color-sequence will repeat again, in the braid and on the fingers. For a 5-loop square braid, it takes 5 braiding cycles (= 10 loop transfers) before all the loops return to the fingers where they started. So the pattern repeat for a 5-loop braid is usually five braiding cycles; seven cycles for a 7-loop braid, etc. However, if the braid has a very limited number of colors, the pattern repeat might be shorter: the few colors might return to the original color-arrangement on the fingers sooner than each particular loop comes back to the finger where it started. Bicolor loop patterns add another factor. Depending on how often the loops are turned, it might take twice as many cycles before the the loops come back to their starting fingers with all the colors in their original upper and lower positions on the fingers. For example, in the flat version of a square braid, the first time the loops return to their starting fingers, each loop has only been turned once, so the colors of any bicolor loops are now in reverse on the fingers (and in the braid). A full pattern repeat for a 5-loop flat braid with any bicolor loops may take 10 braiding cycles (= 20 loop transfers). Or a pattern repeat might be as short as only one cycle (as with an “Edge” -type of bicolor pattern in a square or double braid). In an “edge” pattern braid, the colors return to the same set-up on the fingers by the end of each braiding cycle. Turning or not turning a loop over while transferring it can make a huge difference to how a braid turns out. Doing one or the other, or mixing the two types of transfers, is how you make a braid square, flat, or divide into two braids. ‘Turning’ the loop means taking it off its previous finger in such a way that it gets rotated by 180 degrees (a half-turn) as it moves onto its new finger. This makes the upper and lower shanks of the loop switch positions. In the case of a bicolor loop, this make the two colors of the loop switch positions on the finger and in the braid. Reversed (vs unreversed) were the 15th C terms for this; Turn was used in the 17th C manuscripts; Crossed (vs open) are Noémi Speiser and Masako Kinoshita’s terms. To me, ‘turned’ (vs ‘not turned’ or ‘straight’) seems clearest, and when I teach, students seem to understand it more easily. In writing and in my tutorials I usually cite all three terms because people have different backgrounds in loop braiding. Two types of linking for color effects are possible with loops. Both these linking techniques were used in fingerloop braids described in 15th and 17th C. English manuscripts, as well as in old Japanese “kumihimo” braids and Andean/ Peruvian flat braids which were made with hand-held loop braiding (this is known for Japanese braids, and assumed by some [including me!] for Andean braids). (1) Linking the two shanks of one loop (“turn twice”). With bicolor loops, an optional way to turn a loop is to turn it twice (ie turning it a full 360 instead of 180 degrees). This has a negligible effect on the shape of the braid compared to turning the loop once, but creates a very different color effect, since the colors of the upper and lower shanks of the bicolor loop will not switch positions. When a loop is turned twice, its upper and lower shanks become linked around each other, instead of crossing each other. At that point in the braid, each shank links around the other shank and goes back to braiding on the same layer of the braid where it had been, rather than the two shanks crossing each other to each emerge on opposite sides of the braid (as when a loop is turned only once). This can create lengthwise columns of the two bicolors, for example in a flat braid (where lengthwise columns of color would not be possible otherwise). I teach this in a few posts: 1 (see third video), 2 (see third and 6th videos), and as a pick-up patterning technique in Pick-up 2: Rock Your Square Braid, and Pick-up 3: Flat Braid Pick-up. ‘Turning twice’ can be very useful when braiding pickup patterns, as an alternative to not turning a loop to keep a particular color “up” in the pattern, in a situation where not turning the loop would create a problem with the structure of the braid. (2) Linking two loops (“exchange twice”/ “transfer twice”). However, many online searches are for fingerloop braiding. So I try to use that term at least once in every post. Braiding interlaces strands on a diagonal, often called oblique slant, as compared to weaving, in which strands interlace on horizontal/ vertical axes. Plaiting means the same thing as braiding–it seems to be a regional or slightly old-fashioned synonym, often used in the context of braiding hair or straw. Traditionally pronounced “platting”. A plait (pronounced “platt”) is a braid. Braiding done as a textile technique, and without tools or a braiding stand, has often (confusingly) been referred to as finger weaving. This is probably because people tend to associate the word “braid” with hairstyles rather than textiles. When they see yarn or thread being intricately braided, they might correctly notice that the technique is a type of over-under interlacing like weaving, but done by fingers alone, rather than on a loom. The fact that the strands interlace on the diagonal / obliquely may not be noticed or considered especially important – even by the braider. So far, every time I have read or heard the term “finger weaving” it has been used for some form of braiding, rather than weaving. Braiding machines are quite different from weaving looms, and not as well-known. Here’s a video showing the simplest possible braid, a 3-strand braid, being made on a braiding machine. (youtube links will open in a separate tab.) Here’s a much more complex braiding machine, which still operates by basically the same mechanism (horn gears): youtube example The first braiding machine was invented in the mid-1700’s, and they proliferated in the 1800’s (youtube video of antique examples), first powered by hand-crank or water-wheel, but soon afterward machine-powered. More about the history of braiding machines, and how they work can be found in the beginning and end of this post. Loop braiding has some inherent technical advantages over free-end braiding. Given the importance of cordage and bands in human history, this is probably why loop braiding seems to have had close to worldwide distribution. The inherent technical benefits of loop braiding are: It allows for braiding complex braids faster and more easily than free-end braiding. In simply holding the loops, the fingers or hands form a shed [an opening] in each loop. The braider moves (and thinks about) each loop as if it were a single braiding element. Yet, because of the separation of the two shanks of each loop, they can interlace separately with the other strands in the braid, creating structures that are twice as complex as the number of loops would suggest. Most 5-loop braids have 10 separately interlaced elements, yet can be easily learned by most adults and older children as a first loop braid. Another inherent advantage to loop braiding is that very fine threads can be braided as easily as thicker ones, since the effective working size of any loop is the thickness of the fingers, rather than the thickness of the thread. Also, the tightening of the strands can be accomplished with a few large simple motions, rather than many fussy small ones near the fell, regardless of the fineness of the threads being used — another increase in efficiency. The limitations of loop braiding are in the length of braid that can be made by a single braider (usually less than the length that the braider’s arms can spread apart, or the tension will be too loose), and in the possible number of braiding elements (usually 14-20 strands, which equals 7 – 10 loops) that one braider can manage easily. These are only limitations when a braider works alone. Historically, loop braiders have worked in teams of two or more, allowing an almost infinite number and length of loops. A Chinese bronze about 2 thousand years old shows several figures doing textile work, including a team of two loop braiders in position to make an extra-long braid. Modern loop braiders have come up with various work-arounds for a solo loop braider to braid longer braids and or braids that have more loops than there are fingers to hold them. Braids — including loop braids — can have some of the same types of interlacing as weavings. There is a difference, of course, since in braids that interlacing is on a diagonal, not straight across as in a weaving. But weaving terminology can sometimes be useful for braids as well. To be very exact, for braids you would use the term “oblique interlacing” instead of “weave.” “Plain oblique interlacing” is the more technically correct term for “Plain-weave braid”. Braiders are sometimes very adamant that weaving terminology should not be used for braiding. But even though I don’t call braiding “finger weaving,” I am not averse to using some weaving terminology in the context of braids. Braiding and weaving have much in common structurally, and this can be helpful in describing and understanding braided structures. Fell: The fell is the “working” edge of an in-progress braid or weaving–usually this is the edge closest to the maker. Weavings usually have a straight, horizontal fell. Braids usually have variously-shaped diagonal fells. I believe I have also heard the fell referred to as “the point of braiding” by Kumihimo braiders using a marudai (circular braiding table). A braid in which the outermost strand on each edge of the braid is alternately (left and right) brought/braided all the way to the center of the braid will have a V-shaped fell contour. Here’s an example (in-progress kumihimo braid being made on a takadai). If the left-most (or right-most) strand is consistently interlaced all the way across to the opposite side of the braid, the braid will have an Oblique fell contour, in either a / or \ -shape. A braid in which the central strands are braided all the way to the outer edges of the braid (alternately toward the left and right edges) will have a fell contour like this: ∧. This could be called an A-shaped fell. The actual “over-under” structure of the interlaced strands in either of the three above examples may be identical. The same end result can be obtained with either of these 3 working methods, or even several others. Neither the color-pattern, nor the braiding structure / “weave,” are necessarily dependent on the order or direction in which the threads are interlaced (which is what determines the contour of the fell). The two very basic loop braiding methods known as the “A-fell method” and the “V-fell method” were named by Noémi Speiser for their fell-shapes as a convenient handle to refer to them. The shape of the braid’s fell isn’t particularly visible when using either of these methods. The term refers more to the distinctive, opposing directions of their braiding moves. However, both of these fell-shapes are also produced by other braiding methods, including other types of loop braiding, free-end braiding and kumihimo. For example the Slentre loop braiding method is a different method from the “V-fell method”, but both methods make braids that grow with V-shaped fells. In a braid, the thread or loop that is being moved/transferred may be referred to as weft; while the more passive threads/loops it is being moved or interlaced through may be referred to as warp elements. This is not a completely arbitrary analogy. In some braids—for example my plain weave braids here, and very similar-looking single-course twined braids (described below)—a weft strand or loop is carried a long distance between a shed of upper and lower warp strands. This is very analagous to weaving, and I don’t see a need to invent new and opaque terms to be used in braiding when well-known and equivalent terms already exist. I follow Rodrick Owen’s example in occasionally using the terms “warp” and “weft” for braiding elements, when it seems to be the clearest choice of terminology. Plain weave, close-up view of a woven fabric. A plain-weave braid has the same over-under structure, but tipped on the diagonal. Each (diagonal) row in the diagram below starts with an “over” passage on the left edge of the braid. Yet, just as in the woven example above, all the strands pass alternately over-under-over-under the other strands, in both directions. That is the essence of plain weave, as opposed to twills or other types of weaves. Here’s a link to a nice clear photo-tutorial for making a 6-strand plain-weave braid (not loop braiding, she is braiding with free ends). The braid in the tutorial is actually the mirror-image opposite of the structure in the diagram below – on its left edge each row starts with an “under” passage, while on the right edge each row starts with an “over” passage. The most common hairstyle braid, and the simplest possible braid structure is a 3-element braid: plain weave with only 3 parts. Over 1, under 1 again and again. In balanced plain weave, the warp and weft threads are equally spaced/ equally visible in the finished piece. In warp-faced plain weave, only the warp threads show on the surface, while the traveling threads—the so-called ‘weft’ threads—are completely hidden, except at the very edge of the piece. So, in warp-faced pieces, it’s the closely-set warp threads that form the visible color-patterning. Tablet weaving and backstrap weaving are usually warp-faced and so are many braid types. The opposite type of plain weave is Weft-faced, in which all the color-patterning is in the weft, and the warp threads are not seen on the surface. Weft-faced woven fabrics are very common, but I don’t know of any examples in braids. I doubt it would be possible with loop braiding, because of the tension between the top of the braid and the ends of the loops while braiding. Balanced and warp-faced are actually two points along a continuum…A braid or weaving might be slightly to strongly warp-faced, depending on how closely the warp threads are set, or packed together in braiding. In a “repp*” weave, the weft – the horizontal, “traveling” thread – is much thicker than the warp, so it forms a horizontal bulge with each row. Repp is usually warp-faced. (A common exception is the woven rag-rug, in which the thicker, fabric wefts are clearly visible as they tunnel between the widely-spaced narrower warp threads). In these repp braids, every ‘weft’ element tunneling between the the upper and lower warp threads comprises two threads—both shanks of a whole loop, making the ‘weft’ elements twice as thick as the ‘warp’ elements they tunnel through. The alternating upper and lower warp elements are single threads (the two shanks of each loop move apart in opposite directions for the weft to go through). This produces a thick, flat, ridged, single-layer braid, looking similar to single-course twined braids (described below), which can also be described as repp braids. Repp-type braids are flat overall, but they are much thicker than the flat twill braids I teach in my Start Here, Continue Here, and flat double braids tutorials, or the flat plain-weave braids in my header photo above (the widest 4 braids in the header photo). These two layers of the in-progress flat braid are connected along one long edge of the braid — in the same way that the spine of a book connects the front and back cover. That long edge will become the mid-line of the braid when it is done, once the braid is spread open to form a single-layer braid. After the (originally) two-layer braid has been spread open into a flat, single-layer braid it is twice as wide, and half as thick as an equivalent repp braid made from the same yarn. These are two-layer braids of twill interlacing, or a combination of twill and plain weave. The basic square or “rounde” 5-loop fingerloop braid is 2/2 twill on both layers of the braid (under 2 strands / over 2 strands, but these pairs are off-set by one strand in each successive diagonal row of braiding). A square braid is a very minimal twill structure – only 2 ridges or columns of twill interlacing on each layer (so 4 in all). It is strongly warp-faced. On the upper and lower surfaces (the sides facing to and away from the braider) only the “warp” loops are visible (the passive loops that the traveling loops are taken through by the braider). On the two side surfaces of the braid, each loop forms a V as its two shanks (upper and lower) meet and dive into the braid, changing from passive “around” (warp) loops to active “through” (weft) loops. Those V or A-shaped patterns created by the two parts of a loop meeting on the sides of a square braid is not what is meant by a V or A-shaped fell, by the way. The side of the braid is “straight on” to the fell. You would see the fell from the front or back of the braid (the sides that face to and away from the braider). 2/2 twill: A 5-loop square braid has (for the most part* ) 2/2 twill: each loop goes first through two loops, then around two loops in its trip across the braid. In each successive row, the pairs of passive loops (that the active loop goes through) are shifted over/offset by one loop—which is what makes it a twill. A 5 loop square (or flat) braid has 2/2 twill because each loop is always pulled through two other loops—the ones on the middle and ring fingers. At this point our loop has made it all the way across the braid and is ready to be the next loop taken through the braid from the right side. During this time, the upper shank of each loop is doing its own “unders” and “overs,” while the lower shank is doing mirror-image “unders” and “overs” on the other side of the braid. That’s what makes it a two-layer braid. The two parts of each loop move in parallel, but they don’t stay together in the braid, even though the braider moves them as one. The loops are divided into an upper and a lower braided layer by the consistent, repeated pulling of loops through loops. A 7-loop square braid has 3/3 twill. Each loop is always pulled through 3 loops, after which 3 loops are pulled through it (over the course of three successive braiding cycles) before it reaches the other side of the braid and is ready to be an active ‘through’ loop again. After seven braiding cycles, the loop will be back where it started. Double braids have twice as many twill ridges as a square braid, so 4 on each layer of the braid, while my 18-loop “letterbraid” has 4 times as many twill ridges – 8 on each layer of the braid. The traditional letterbraids also have 8 ridges, but these are partly to mostly plain weave rather than twill, like a 3-loop ‘square’ braid. Above is a poor representation of the 4 ridges of a flat ‘square’- type braid — with the thread-slants spread apart so the columns are more apparent. The slashes represent every visible thread passage in a short length of the braid. In a real braid there are no spaces between them, either vertically or horizontally. Each ridge’s visible column of slanted threads covers another column of threads having the opposite slant. (this can be seen in a flat braid by turning it over). On one face of a ridge are the ‘overs’ and on the other face are the ‘unders’. The square version of this braid has the same 4 ridges, though only two of them are clearly visible on any one side of the braid. Each ridge forms one of the four corners of the square braid. In a square braid only one “face” of each ridge is viewable – the “overs”. The “under” passages are hidden within the braid. In loop braided twining, the traveling course–the weft–is always at least one whole loop (2 strands) or more. Unlike the loops of 2-layer braids, these ‘weft’ loop strands do stay together in the braid’s structure while they are “weft”–they cannot separate into an upper layer strand and a lower layer strand. Meanwhile, the alternating upper and lower warp elements that the weft loop tunnels through are alternating single strands. 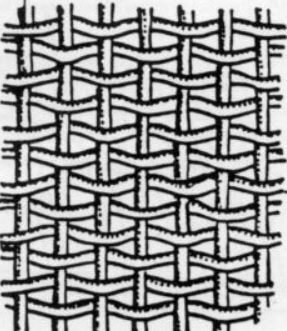 The resulting overall texture is repp (also spelled rep) — very similar in appearance to a repp plain-weave braid (described above, under plain weave)*. Plain Oblique Twining (POT) is another, more intricate type of twining. In POT a loop is twisted before going through one loop, and then passes untwisted around the next loop (which itself gets a twist) and so on across the braid. Here is a photo illustrating POT, showing of very open, meshlike example of POT on the L-MBRIC website. When POT is tightened, its twined structure is not very visible. See my Rainbow Girl braid which was made with plain oblique twining (4th braid from left in my header photo, top of page). When the braid is tightened firmly, the surface color-patterns usually look similar to plain weave patterns. However, the fabric is twice as thick as a regular plain weave would be. Oblique Countered (or Counter-) Twining, common in ancient Andean flat braids (as well as in some Japanese braids, as Rodrick Owen has just informed me!) is a type of twining in which two adjacent loops are turned in opposite directions, before another loop or loops is passed through them as the traveling or hidden course. In Andean braiding, it was often another pair of loops that was passed through the countertwined pair. If these two pairs of loops are of different colors, the braider can choose which color will show in that particular stitch / “pixel” of the braid by selecting which of the two pairs goes through the other. The color of the ‘around’ pair will be the color of that stitch. This allows the braider to plan and manipulate the color pattern of the braid. This is especially effective in wide braids of many loops which allows for very complex patterning. 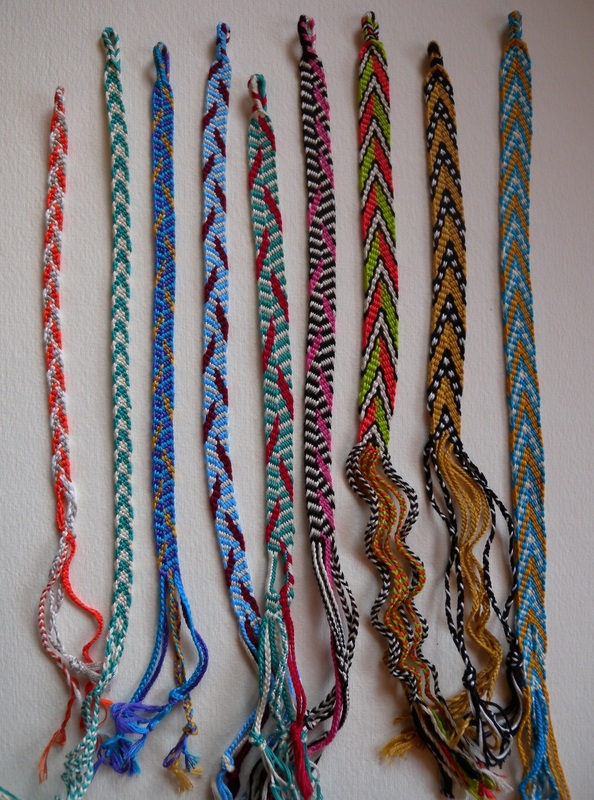 Many ancient andean flat twined braids were made with over 50 to hundreds of loops. There are many examples of counter-twined braids in my Halloween post last year — Rodrick Owen and the Braids of the Mummies. This is because a “passive” loop held on one finger can be braided around—as if its two strands were a single element; while the passive loop held on an adjacent finger can be braided through—its two strands treated as separate elements forming a shed comprising an upper and a lower strand. This “shed” is not equivalent to one of the alternating sheds that heddles create on a loom. Rather, that upper and lower separation marks a division between an upper braided layer and a lower braided layer. With each successive row, the loops on the fingers shift over by one loop—this might seem similar to a twill, but the “upper” and “lower” separately interlaced strands of the fourth finger’s loop adds a whole different dimension to the structure. 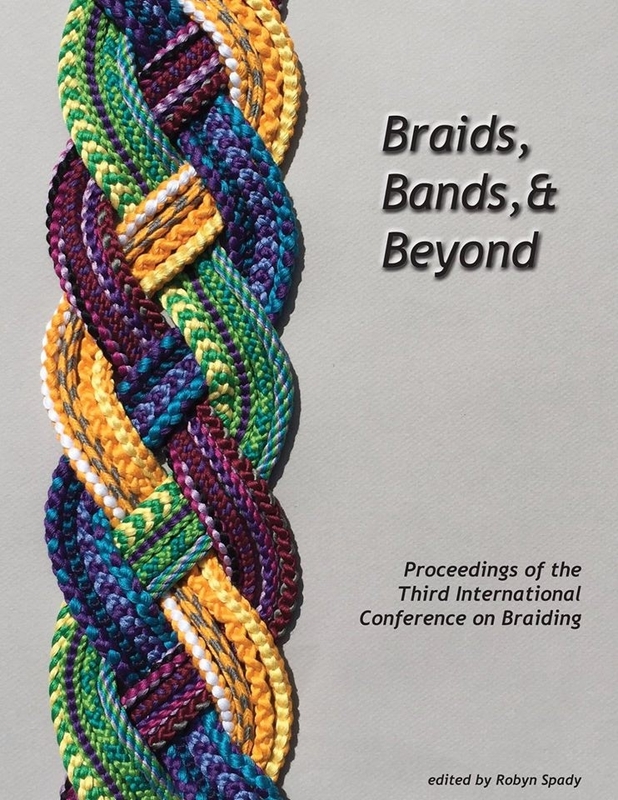 See my info page on unorthodox braids, and see Noémi Speiser’s Old English Pattern Books for Loop Braiding for a more detailed analysis (you may have to learn her “track-plan” diagramatic system to follow her analysis). * Masako Kinoshita and Noémi Speiser prefer the term loop-manipulation braiding, or finger-held loop-manipulation braiding when they want to differentiate it from hand-held loop braiding. (Masako Kinoshita then shortens this to f-h l-m braiding). To me, the meaning of the word ‘braiding’ already includes the sense of “manipulation”, so I prefer “loop braiding” for simplicity’s sake. “Finger-held” also feels a bit cumbersome to me, but to Speiser and Kinoshita the compound word “fingerloop” or “finger loop” has a childish/ baby-talk connotation that they want to avoid. I totally appreciate this, since loop braiding often seems to be considered a childish string trick rather than a true textile technique! However to me ‘fingerloop’ seems like a normal English compound word rather than a childish combination. “Handloop braiding” is problematic – in speech or if written as “hand loop braiding” – because it could be misinterpreted as meaning “loop braiding done by hand” as opposed to “loop braiding done by machine”. “Hand-held loop braiding” is more cumbersome, but it’s clearer than “hand loop braiding”. I’ve occasionally seen others drop the word “braiding” altogether, leaving “loop manipulation” alone. I have to admit that this really bugs me–it omits the most important word! ‘Loop manipulation’ alone could apply to knitting, crocheting, many Chinese decorative knots, a popular type of potholder-weaving, or even linking rubber bands together. *Twill loop braids often have an extra float in some ridges due to the inherent mechanics/ geometry of braiding with loops, so when I describe a square or double braid as having 2/2 twill it’s a slight oversimplification. One or more of the braid columns in a 2/2 twill braid may in fact be 3/3 twill. After learning how to do single course twining using hand-held loop-braiding, I realized that if I reversed the direction of the twist with alternate rows of braiding, the result would be plain weave rather than twining. Since that epiphany, I have occasionally used this ‘alternating turning direction’ as a plain-weave braiding strategy, both with hand-held and finger-held loops [see my Warp-faced plain weave braids]. It is a very efficient method for braiding warp-faced, plain-weave repp. With fingerheld loops, it isn’t even necessary to actually turn the loops on the fingers – on alternate rows, the active finger can simply reach in an “upside-down” manner through each loop on the way to fetching the traveling loop (on every other braiding cycle/ row of braiding moves). By “upside-down” I mean inserting the operating “fetching” finger through each loop in a weird ‘upside-down’ manner. Instead of putting the finger through the loops the obvious way, I reach under the lower shank and then over the upper shank of each loop. This has the same net result as if I had first turned every passive loop over on the fingers, then braided through them normally, then turned them all back over (in the opposite rotational direction). It is a much more efficient to reach through each loop ‘upside-down’ than to physically turn and re-turn all those loops on the fingers before each row of braiding. I haven’t heard of “alternating turning” being used before in loop braiding to create plain weave, but I strongly suspect it was the method behind certain ancient Andean warp-faced, repp-like plain-weave braids. If so, they too may well have been made by hand-held loop braiding, which is how twined Andean flat braids are assumed to have been made. (At first Rodrick Owen disagreed with me on this but he may be coming round!) It is very easy to do – in one row you turn all the loops in a clockwise direction before passing the weft loop through; and in the next row you turn all the loops counterclockwise, before passing the next weft loop through. That undoes any twist to the warp loops, and results in plain weave, usually with a warp-faced repp texture, much like the equivalent twined version in appearance. See full copyright restrictions and permissions at the bottom of the sidebar (if you are on a small screen, the ‘sidebar’ may appear somewhere other than the side of the screen). Content of this website may not be posted or “reposted” online, sold, or used in fee-based workshops without my permission. It may be shared off-line with certain restrictions – see full copyright info.